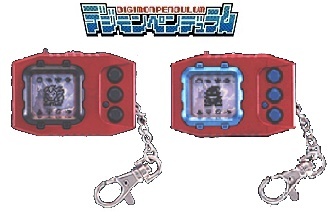 The Digimon Pendulum (デジモンペンデュラム) is the second in the series of the Digimon Virtual Pet. Each version has a roster of 20 Digimon and additional functions such as the Pendulum training and Jogressing. It evolves through 6 stages after hatching from the egg, beginning with the Baby Stage and ending in the Ultimate Stage. 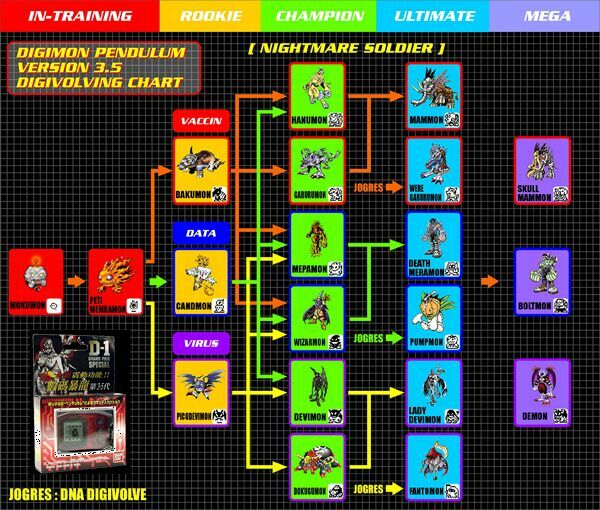 Digimon Pendulum Nightmare Soldiers (デジモンペンデュラムナイトメアソルジャーズ) is the third version of the Digimon Pendulum virtual pet. This Pendulum includes the first edition 3.0 and special edition 3.5 featuring a slightly altered cast of Digimon. Hanumon/Garurumon: 2 or fewer Care Mistakes, Win Ratio 40% or higher, Training 40+ times, Battle 30 times. This is a Jogress Digimon. Combinations are below. Meramon/Wizarmon: 4 or less Care Mistakes, Win Ratio 40% or higher, Training 40+ times, Battle 30 times. Devimon/Bakemon (3.0)/Dokugumon (3.5): 1 or less Care Mistakes, Win Ratio 40% or higher, Training 40+ times, Battle 30 times. – A “Care Mistake” is when the call icon has been lit for 20 minutes and then goes out by itself. The call icon will activate when your Digimon runs out of hearts, or when it’s time to turn out the lights. Waking the Digimon during sleep is also counted as a Care Mistake. If you want the Digimon to wake up, without this being counted as a Care Mistake, then set the clock to some time during the day. If the Digimon doesn’t get its 8 hours of sleep, its DP won’t be restored, be careful. Waking the Digimon directly, or failing to turn off the lights, will also move its regular waking time to later in the day. – Training only counts for evolution when successful. – To get a Perfect Digimon, a Win Ratio of 40% gives you a 1/5 chance of evolution. 60% or more gives you a 1/4 chance and, 80% will give you 1/2 chance of evolution. Even meeting the 30+ battle may still not be enough for evolution. To ensure an even greater chance, battle during the Child stage and achieve as high of a Win Ratio as you can prior to evolving into Perfect. – If your Digimon dies after a full life and was taken very well care of, it may leave behind an egg. This is what is called a “Traited Egg” and once hatched it will give you an extra 10% of evolving to Perfect. The results are cumulative also, so numerous generations of Traited Eggs will add 10% for each generation.